Let me introduce myself: I’m the latest addition to the Ventex Technology team. I came from a solar panel background, so science and technology are not a foreign concept to me. That being said, as someone new to the neon industry, I’m devouring as much information as I can (I’m currently reading our very own Morgan Crook’s “The Neon Engineers Notebook”), absorbing what makes benders tick and along the way, realizing how neon is so culturally ingrained in us. While I did not know it before coming to Ventex, neon is weaved into the threadwork of our daily lives. Perhaps you can relate to noticing every. single. neon install. once you started in the industry. I’m experiencing that now and was reminded of the fond memories tied to one neon work of art near my hometown. Growing up in the Chicago ’burbs with a mother who loved to travel meant heading to O’Hare International Airport every so often to begin our next adventure. Typically, this meant going through the United tunnel between Concourses B and C, where neon floats above the heads of travelers as they move along the walkways. In case you’re not familiar with it, this artwork is titled “The Sky’s the Limit” and designed by neon sculpture/artist Michael Hayden. It features a mile’s worth of neon and was installed in 1987. 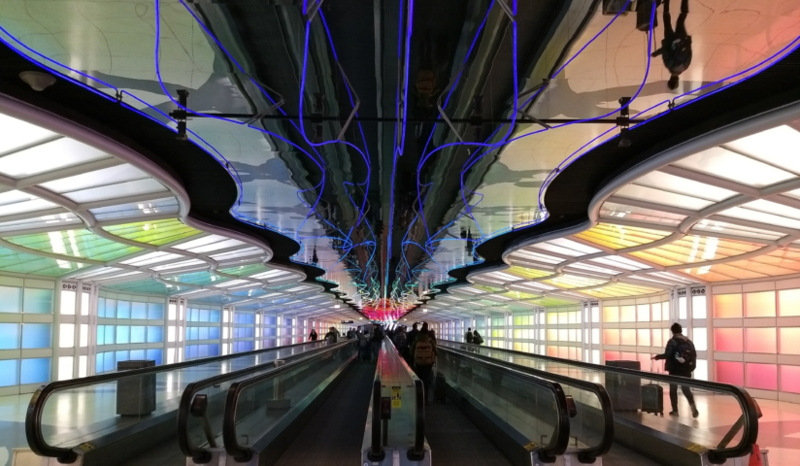 As a child, this was always my favorite part of the airport – the playful rainbow lights as they raced up and down the tunnel. I loved it so much that I ended up learning how to play “Rhapsody In Blue” – the song that is playing in the tunnel due to its use in United commercials – on the piano. Seeing the colorful lights signaled that I was about to see new places, meet new people and create new memories. I’m not the only one with fond ties to this neon install. One quick look at YouTube videos of this iconic neon shows comments reflecting its positive effect on others, including drawing people back to the tunnel just to see the lights again. This past weekend, that was me. Now that I live in Texas, I had to fly American Airlines, but I made a beeline to see those familiar lights cast a warm glow on holiday travelers. You can’t help but be in a better mood while watching them, as you can see from the cheeky passersby in the video I took. So I want to know: What’s your favorite neon install (whether your own or someone else’s work)? Is it what inspired you to work in the neon industry? Comment below and feel free to share some photos with us on Facebook! These two articles are from San Jose and are about a very iconic sign in our city that needs some work to revive and bring back to life. Awesome sign — we hope the pig gets to dance again! Im sure it will with the help of our largest customer YESCO. Hope we donate something as well.